I walked into a comic book shop down the street from where I worked on a lunch break recently and there on the new release rack there was a comic book seemingly taunting me. 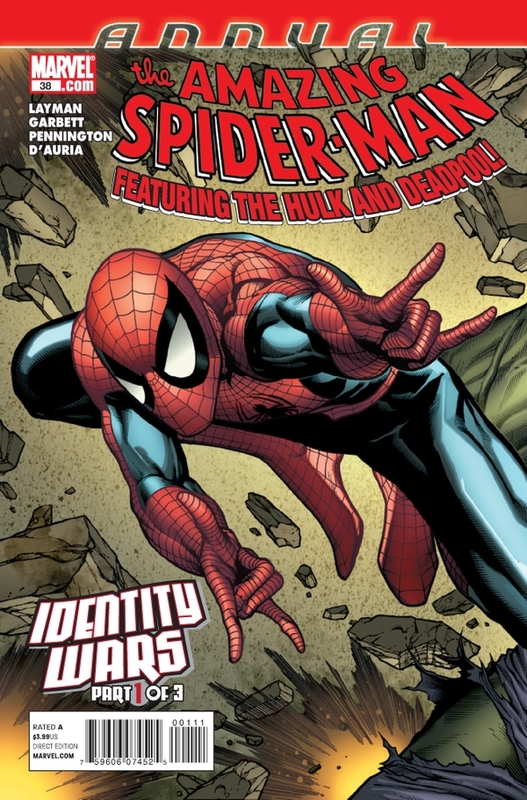 The Amazing Spider-Man Annual for 2011. Those stupid annuals. I’d like to say they’re the forgotten part of my quest, but in reality they’re ignored. The once a year releases that are technically part of the Amazing Spider-Man universe but oftentimes rarely tie-in to the current storylines. I know that’s not always the case – the first ever Amazing Spider-Man Annual introduced the supervillain supergroup (think Led Zeppelin without the devil worshipping) the Sinister Six and Annual #21 was the marriage of Peter Parker/Spider-Man and Mary Jane. But there are also a bunch of annuals out there that are reprints of earlier issues, or in the case of this year’s annual, #38, are used to market and promote characters from other comics like Deadpool, the Hulk, etc. There’s nothing wrong with any of this – if people want to buy a comic to read content from an older book, or to get a storyline that involves a variety of different superheroes, that sounds great. But from a collecting standpoint, I just don’t know how to approach the “annual question.” If you reference my site’s right sidebar, I very definitively say I don’t count annuals in my chase. Of course I own some of the annuals. And in the case of #38 it was right there on the shelf so I picked it up. But I still have a hard time resolving this idea that they’re part of my ultimate “quest.” If I happen to achieve my comic book nirvana and get every issue of Amazing Spider-Man, but I’m still missing about a dozen of the annuals, have I not really achieved my goals? This is some heavy duty stuff folks and I would love some input. Here’s another problem I have with the Annuals. For about 10 years, I’ve actually been a subscriber to Amazing Spider-Man. While I love the local comic book shop as much as the next guy, and the physical act of picking up a comic and buying is a more personable, touchy-feely story, the subscription saves me some time and money. Just like any other periodical, a yearly subscription costs less than getting each individual issue, and I also don’t have to worry about getting to the comic book shop on every new release day and tracking down ASM. This is especially valuable for issues that are in high demand, like when ASM had a President Obama “feature” a few years ago after the 2008 election. Or when ASM published three times a month the past few years. That’s a lot of lunch hours lost buying comics. But despite being a subscriber, I have never received an Annual from Marvel. Not that I was ever promised one, but with other magazine subscriptions, the equivalent of an “Annual” feels like something that should be a perk for the loyal customers. Heck, Sports Illustrated sends me a sweatshirt every year. You’re telling me that Marvel can’t send me the ASM Annual every year instead of making me go out to the store and buy it? With all this said, I will eventually get all the Annuals, just because I’m too obsessive of a personality not to. But not anytime soon. And just to make peace of things, I’m going to continue with my life under the guise that the Annuals are not part of my chase. And if any of you out there feel that this irrational attitude cheapens my chase, please let me know. Because your response may actually torture me enough to reconsider for a few seconds, until I completely forget it and ultimately miss out on when ASM Annual 39 comes out next year, because I didn’t even know it existed. I have never subscribed to a comic before, so I did not know that you did not get the annuals in with the regular issues. When I originally heard you werent counting them I thought it was a cop out of sorts. But if Marvel can’t be bothered to send you an issue for being a loyal subscriber, then that to me shows they don’t even count the issues as part of the series. So now I am with you on not including them in your journey. Reprints are the bane of the comic collector, they not only take away the value of the originals but I have on accident bought a reprint when I thought I was getting a part of the regular series. I also hate fill ins, again I have purchased fill ins by accident when I assumed I was getting the next part of the story. It sounds to me like the Annuals encompass both of my pet peeves in comic buying, so other then the occasional, I want to read this annual because it looks fun,” I would say dump them. After consideration, I’m pretty sure you can skip the annuals with no original material, but it seems like you should probably get the others. Maybe it’d be enough for you just to get reprints? I know Marvel Tales reprinted at least the first annual and maybe others. A cheaper alternative to Annual #2 is Dr. Strange #178 (original series), which reprints it and can be found for a fraction of the price. I can also recommend Annual #4, which is one of the better Spider-Man stories I’ve read (I don’t know if it’s on my top 10, but it would probably make my top 20), guest-starring the Human Torch and with a couple mystery villains. I picked up a decent copy fairly cheaply a couple years ago. By the way, if you’re looking for an idea for a post one day, maybe you could list your top 10 Spider-Man stories. I’d be interested to see such a list from someone who’s read nearly every issue of Amazing. And thanks for the suggestion Thelonious … I’m actually dabbling at some point either doing a “favorite stories” or favorite “panels” feature (or both). Yeah… you just GOTTA get the annuals for better or for worse. For 1 they say ASM right at the top! 2: they are even listed in price guides directly after the current issues. 3: they are in cannon. As far as subscriptions go, I understand what you are saying. But at the same time they aren’t a “bonus” to existing subs – they are more 1-shot all in 1 & done type of stories. This attracts not only the monthly readers but other casual readers and in this year’s case possible CHEW readers as John Layman is the writer of the 3-chapter saga. So, no I’m sorry but they aren’t part of what you pay for so they just aren’t included. As far as when they come out – man, do you order a Previews? Even if you don’t, at least go to DCBService.com and d-load the monthly Excel list that has all of what is in Previews so you know what’s coming out. OR – just frequent CBR.com and the Marvel solicits usually come out the 3rd Tuesday / Wednesday of every month. Heck, if you even subscribe to Marvel’s e-newsletter they tell you when the solicits are up. I’m thinking this is part of the downside to subscribing to Marvel comics directly.